Ahmadiyya Muslim Association volunteer Siemah Ahmad, 38, tells Sebastian Murphy-Bates how she and fellow believers spread peace through charity. “Our group does a wide range of voluntary work including making up hampers for women who’ve had to flee violence to a refuge. We fill the hampers with things they need after leaving their homes in an emergency, not just in Barking but up and down the country. “We make sure we involve our children in making the hampers and last time I filled one I did it with my six-year-old daughter, Fouzia, telling her it’s essential we look after everybody around us. “I also help put on events at Fouzia’s school and volunteer with the elderly at Chestnut Court Care Home in Frizlands Lane, Dagenham. And in November the Ahmadiyya Muslim Association (AMA) joined forces with the Royal British Legion to raise money in the Poppy Appeal. “The AMA aims to do as much charity work as possible because Islam means peace and submission. 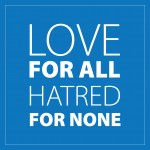 The AMA started in 1889 and we’ve been leading a global effort to spread the peaceful message of Islam ever since with our motto ‘love for all, hatred for none’. “Unfortunately our group is persecuted in Pakistan, where we’re regarded as non-Muslims. It’s very sad because we’re only promoting a message of peace and in the face of persecution we don’t retaliate. We write to our MPs and we use peaceful channels even when we face violence – we won’t compromise on this. We also believe that loving your country is part of the faith, so whether you’re a Muslim living in England or France you should be loyal to your state. “I’ve really enjoyed living in Barking since I moved her from Blackburn to marry my husband, Mubasher, 16 years ago. It’s a positive, multicultural place and I feel a real sense of community here – it’s my home now.